Cinema and opera have become intertwined in a variety of powerful and unusual ways. 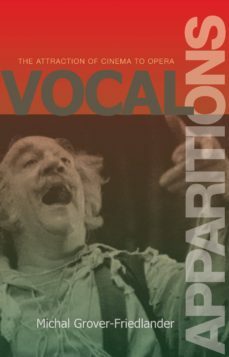 Vocal Apparitions tells the story of this fascinating intersection, interprets how it occurred, and explores what happens when opera is projected onto the medium of film. Michal Grover-Friedlander finds striking affinities between film and opera--from Lon Chaneys classic silent film, The Phantom of the Opera, to the Marx Brothers A Night at the Opera to Fellinis E la nave va. One of the guiding questions of this book is what occurs when what is aesthetically essential about one medium is transposed into the aesthetic field of the other. For example, Grover-Friedlanders comparison of an opera by Poulenc and a Rossellini film, both based on Cocteaus play The Human Voice, shows the relation of the vocal and the visual to be surprisingly affected by the choice of the medium. Her analysis of the Marx Brothers A Night at the Opera demonstrates how, as a response to operas infatuation with death, cinema comically acts out a correction of operas fate. Grover-Friedlander argues that filmed operas such as Zeffirellis Otello and Friedrichs Falstaff show the impossibility of a direct transformation of the operatic into the cinematic.Paradoxically, cinema at times can be more operatic than opera itself, thus capturing something essential that escapes operas self-understanding. A remarkable look at how cinema has been haunted--and transformed--by opera, Vocal Apparitions reveals something original and important about each medium.